frevvo Live Forms already supports digital signatures so any authenticated user can digitally sign a section, lock it down and prevent tampering with the data. That’s an incredibly powerful feature but many customers still want the ability to add a wet signature via signature pads like Topaz devices, touchscreen computers and mobile devices. We’re working on that and expect that it’ll be available in the next release. As usual with frevvo, we’ll make sure this is extremely easy to use. How will it work? You’ll be able to drag and drop a new Signature control from the palette anywhere into the form. You can make it required, add a tool tip, style it etc. like any other control. To sign, simply click or touch a signature control, and frevvo will present an entry dialog. Sign using a touchscreen, track pad, stylus or just using your mouse. Click Done and the signature is displayed in the form scaled down into the signature control as shown below. how do you save the signature to our system and allow it to retrieve as well? 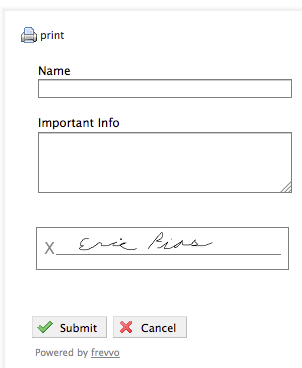 When designing a frevvo form with an electronic wet signature control, the captured signature is attached to the form submission as a PNG image attachment. Frevvo Live Forms provides various document actions for deciding what additional actions will happen with the actual data that makes up the form submission(including the signature png image). For example, should you choose to post the data to your web application, then the signature png is part of that posted data. Should you choose to email the data, the signature PNG will be attached to the email. Finally, should you choose none of these things, then the captured signature PNG is available for downloading by browsing your submissions within frevvo.